73% of customers say this fits as expected. Levi's have always been my go to jean as they fit me well, these pull on jeans are no exception. They were as expected and true to the pictures and description. These jeans fit great and are very comfortable. The classic look of jeans with the flexibility of a legging featuring an elastic waist and slimming silhouette. The classic look of jeans with the flexibility of a legging featuring an elastic waist and slimming silhouette. Made with tummy-slimming and curve-smoothing technology. Designed to shape, slim and smooth. Stretch denim has great recovery. Skinny leg: 11.25" Skinny leg: 11.75" Skinny leg: 11" Skinny leg: 11"
The classic look of a jean with the supreme comfort and mobility of a legging. These jeans feature an elastic waistband and stretch fabrication, allowing you to slip on with ease and stay comfortable all day. Looks great with a Levi's Trucker Jacket and tunic. 5.0 out of 5 starsBest Mom Jeans.... ever. These jeans are amazing, just like the reviews say! Very well made, stretchy and a nice color! 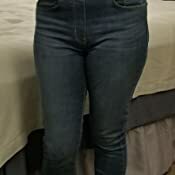 I would say these jeans run very true to size, but if you are over 5’ 5”, order the long! I’m normally a size 12 (5’ 5”, 165 lbs post pregnancy) so I ordered the 12 regular. Fit perfect (I like my skinny jeans to fit a little tight). Love the high waste and actual pockets in the front! These are great for postpartum when you are in between sizes, but just want to wear normal jeans. It’s probably also worth noting that even with the tight fit, there’s no muffin top! Amazing! I will definitely be ordering more! I don't usually write reviews, but I love the way these jeans fit and look. Most reviews don't have measurements, just height and weight. All of us carry our weight differently though so I'm putting my measurements here as well. I'm 5'7", 165 pounds. Waist is 30", hips 41". I ordered the size 10 and they fit perfectly. High enough that I don't have muffin top or plumber's crack. They are as heavy as my Levi's 505 Jean's, and have just enough stretch to be super comfortable. I haven't washed them yet, so I'm hoping they are just as perfect after washing. I already ordered 2 more pair anyway. Yes! YES! YAAAAAAASSSSSS! Most perfect pair of jeans I own. I have a difficult body type to fit. Short and pear shaped. Pants are impossible. But these jeans have changed everything. Great length. Great shape. Great rise. And NO buttons or zippers! 5.0 out of 5 starsReal denim jeans and not jeggings! These are true denim jeans! Usually when you order pull on jeans, they are more like jeggings. These are actual denim and look just like jeans because they are! :) I will say this.....they are high waisted. If you are looking for low rise, these are not those jeans. I'm 5' 3" and weigh 118 lbs and the size 8 fits me with a little room to spare. I bought these in "shady sky" which is a darker denim color Barely faded on the legs. The photo looks more faded than what I got. Fine with me. I'm old school and like to wear my jeans out naturally.They are true to size for Levi's. One of the problems with clothes shopping now a days is it seems each brand has their own sizing system. These are as stretchy as a jegging but the fabric is heavier so they seem more like jeans. The jeans seem to have quality construction and sewing. I will wear them a little bit and put them up during the warmest part of the summer because they are a heavy fabric and then bring them back out in the fall. 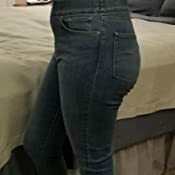 I love these jeans and as always, it's a pleasure dealing with Amazing Amazon! Thank you! I like them, but they’re not my favorite. I’m a type 1 diabetic and I often wear an insulin pump on my lower waist. I typically wear a size 10 in Levi’s jeans, just to leave me some extra room for the pump. These pants are a little bigger than I thought they’d be. I wish they had belt loops to help prevent them from falling down. I like that they actually have front pockets, a lot of Jeggings I’ve bought don’t have the front pockets. I love these jeans! I got the dark black ones and they are so incredibly comfortable. It's so nice not to have the typical button and zipper and have something a lot more comfortable, not to mention the lack of the bulge under shirts from the button. These fit the same for me as the other pull-on skinny jeans from Levi's that I have.